In March 2011 there were 23 professional boxing promotions in the UK and Ireland. This is a higher than average number compared with recent years and, on the face of it, British boxers currently have plenty of scope for activity. In March 1930 there were 484 professional promotions. To say that domestic boxing has changed out of all recognition in the last 80 years is to state the obvious. The dramatic decline in the number of active boxers and promotions demonstrates this extremely clearly. What might be hard to fathom these days is the sheer number and range of towns and cities that held regular boxing events in the old days. Colne in Lancashire currently has a population of around 20,000. In 1930 it was a mill town in the depths of an industrial depression and with about the same number of inhabitants as today. During March 1930 this small town managed to sustain nine professional boxing promotions. West Stanley, a pit village in Durham, held 13 such events within the month. Boxing occurred more than once per week in places as far afield as West Hartlepool, Salford, Preston, West Bromwich, Norwich, Morecambe and Leicester, as well as in the major cities of Manchester, Newcastle, Glasgow and London. 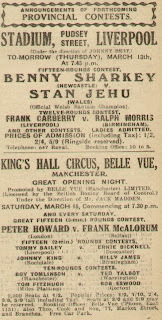 On the evening of 7 March one could have chosen from any one of three professional boxing shows held in Preston, at the Marathon Stadium, the Majestic Rink or the Prince’s Theatre. Of the twelve contests that took place in the town that night, six were over 10 rounds, five were 12-rounders and one was a 15-rounder. None of them were less than ten rounds. Hard times bred hard men. Weekly shows took place at Alfreton, Ammanford, Ashton-under-Lyne, Aston, Bedminster, Belfast, Birmingham, Bishop Auckland, Bradford, Catford, Castleford, Chesterfield, Coventry and Crewe. And these are only the towns, cities and districts beginning with the letters A to C that held weekly shows. The full list covers 60 different venues across Britain where one could see boxing every week. There is nowhere in the UK doing the same today. Boxing took place during March 1930 at towns that have rarely seen boxing at all since the war. These included the likes of Torquay, Penrith, St Ives, Edenbridge, Sevenoaks, Treorchy, Blyth, Rugby, Kidderminster, Barnoldswick, Sidcup, Tylorstown, Helston, Dartmouth, Swindon, Rhyl, Goole and Weston-super-Mare. Most of the boxers who took advantage of this wealth of opportunity were fighting to put food on the table. Many of them would have lost their fathers during the Great War and, at this time, lads of 16 and 17 were often the breadwinners. In the depressed industrial cities of the North and Midlands, the pit villages of Scotland, Wales, the North-East and Kent, and in the market towns of Central and Eastern England men worked 45 hours a week for £3. Little wonder then that a chance of a fight for 30/- or £2 was a welcome prospect for many a young lad. The average fight fan looked for some form of entertainment to take him away from his work or his home. There was little else on offer. Weekly football matches were one such opportunity, as was the chance to watch Rugby League in the North or Rugby Union in Wales. For most, the only respite was the local pub or club. Boxing was therefore hugely popular amongst working men up and down the country. Many of the shows that they attended were unlicensed. The British Boxing Board of Control had only introduced licenses for boxers, managers, referees and promoters the year before. Any enterprising businessman with a bob or two to spare could run a boxing promotion and hope to make a small profit. Attendances were pretty much guaranteed, particularly if two local lads topped the bill. Men like Joe Wiggins at Saxmundham, Will Cozzi at Folkestone, Lloyd Page at Bognor Regis and Stan Squires at Hull chanced their arm during the month in an attempt to make a few quid and provide opportunities for the young lads who packed the local gyms and athletic clubs. These shows typically took place in town halls, drill halls, ex-servicemen’s clubs, miner’s halls and assembly rooms. Swimming pools and skating rinks were covered over with boards so that rings could be erected and rows of seats accommodated. Punters were squeezed in for as little as 1/4d standing and 2/6d ringside. 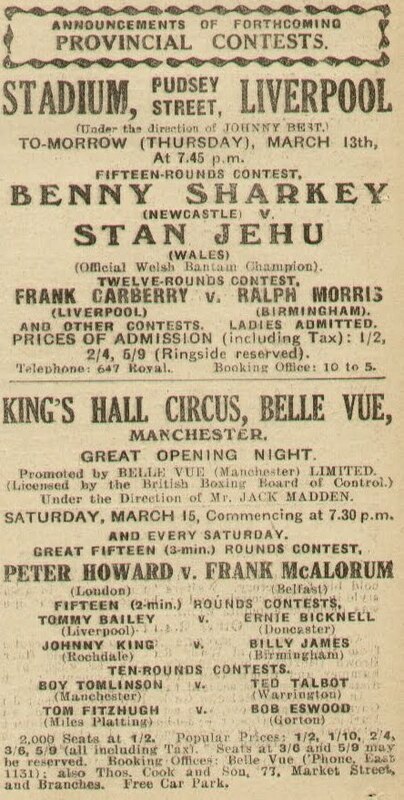 During March 1930 it would have been possible to watch one British title contest and two official eliminators for British titles. It would also have been possible to observe many unofficial title bouts, a 15-round fight for the Hampshire lightweight title at the Connaught Drill Hall in Portsmouth, a 15-rounder for the Irish welterweight title at the Guildhall, Derry, a 12-rounder for the Nottinghamshire flyweight title at the Victoria Baths, Nottingham and a 10 rounder for the Cornish bantamweight title at St Austell.